Hypothermia and How to Avoid it. Every year people die of hypothermia or in hypothermia-related incidents. Hypothermia most commonly takes hold when people are not prepared for it. They are often ill-equipped or dressed in inadequate clothing. They do not understand the contributing factors; they do not recognise the signs and symptoms in themselves or their companions and they do not know how to remedy the situation before it becomes too late. Even experienced outdoors men and women have succumbed to hypothermia. Given hypothermia is one of the greatest hazards in the outdoors, it is essential we all make an effort to understand what brings it about and how to avoid it. When you are awake, your body needs to maintain a core temperature of approximately 37oC (98.6oF). This is sometimes referred to as ‘normothermia’, i.e. your normal temperature. Used as a prefix, ‘hypo-’ means ‘under’ or ‘below normal’. So hypothermia means below normal temperature. Medically, hypothermia is defined as a body core temperature below 35oC (95oF). This represents a 2oC (3.6oF) drop from normal body core temperature. This allows for normal temperature fluctuations that occur through a 24 hour period, including temperature changes in your body while you sleep. In reality, however, if someone is awake, normally fit and healthy and has a body core temperature of 35oC (95oF) in a remote outdoors setting, they are likely to be in trouble already. If they still have the energy they may well be shivering violently. In the outdoors, you need to do something about a falling body core temperature before it gets to this stage. We need to look for signs and symptoms of hypothermia in our companions. Learning to recognise the signs and symptoms – and recognise them early – is very important. “How do you get hypothermia?” is a question I’ve heard quite a few times. It’s not a disease and it’s not catching! But if you are already unwell, this can contribute to your susceptibility. More on this and other risk factors below. When the ambient temperature is less than 28oC (82oF), unless your body is protected, you will lose heat to the environment around you. This means hypothermia can occur in deserts or jungles, not just in arctic or mountain environments. In fact hypothermia can occur at pretty much any latitude. The maintenance of your normal body core temperature, or normothermia, depends on your ability to generate enough heat to balance the heat lost to your surroundings. Hypothermia occurs when your body’s heat loss exceeds its heat generation, causing the heat content of your body to drop. As the heat content of your body drops, your body core temperature will start to fall. As your body core temperature drops, your body’s systems start to shut down with vital organs eventually ceasing to function. If this process is not halted, it will lead to death. We can see from the above that, in general terms, hypothermia can come about through increased heat loss or decreased heat generation. Outdoors, hypothermia comes about though exposure or immersion. Exposure hypothermia is characterised by chronic exposure to the contributing environmental factors of wind, wet and cold. The greatest risk of hypothermia exists when all three of these factors are present but a combination of any two of them is sufficient to provide an environment where significant heat loss is possible. Also, if the temperature is low enough, such as in the boreal forest in winter, there can be a large enough temperature difference between you and your surroundings to create significant heat loss, even in the absence of moisture or wind chill. 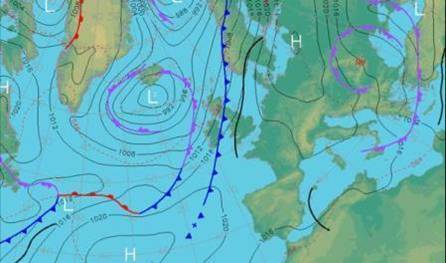 Weather bringing cold, wet, windy conditions poses the biggest threat. Most cases of exposure hypothermia occur when the ambient temperature is between 6oC (42.8oF) and -6oC (21.2oF). It is within this range you are most likely to encounter wind, wet and cold all at the same time. Many incidents involving hypothermic casualties have occurred in temperatures close to freezing, with strong to gale-force winds and wetting of the clothes, particularly due to inadequate waterproof clothing. At higher temperatures, the cold is obviously not so much of a problem. Even so, at temperatures as high as 10oC (50oF) if wind and wetting have been present, hypothermia has ensued in cases where the clothing worn was inadequate. Clothing being wet-through is a common factor amongst many cases of hypothermia in wild and remote areas. With an air temperature of 5oC (41oF) and wet clothes, your heat loss may be double the rate it would be if they were dry. So, how long does it take to get hypothermia? Many incidents involving hypothermia have occurred on hiking routes that would be considered straightforward during fine weather. In these cases, signs and symptoms of hypothermia typically began within 6 hours of setting out on the journey, often within 1-2 hours of the weather deteriorating (i.e. becoming cold, wet and windy). The time between the first signs of hypothermia and physical collapse has been recorded as little as 1-2 hours and death has come as quickly as within 2-6 hours. These figures should indicate to you that even as a day-hiker you should take the threat of hypothermia seriously. Because they anticipate being home by night-fall day-hikers are often the worst prepared for poor weather, delays and the possibility of being benighted. Hence, they carry little or no camping or emergency bivouac equipment, a very limited supply of food, no torch and few spare clothes. Exposure hypothermia is an insidious process. It creeps up on you. If you are the victim you may well be the last to notice it. Whatever the level of your experience, you should never underestimate the risk. Inadequate clothing has been implicated in many cases of hypothermia. Being wet through significantly increases your heat loss. Add to this insufficient or a complete lack of windproof clothing on a windy day and you can quickly envisage a disaster scenario. Exertion leading to physical exhaustion is normally a factor in the more serious cases of hypothermia as it eventually leads to a decrease in heat generation either through lack of energy and/or lack of activity. The level of your energy reserves is vital in fending off hypothermia. In moderately cold conditions where your body is subject to cooling over a long period, while your energy reserves remain intact, your body can work at a rate that generates enough heat to offset heat loss. Once your energy reserves are exhausted (what athletes would call “hitting the wall”), you can’t maintain your rate of work and heat supply falls. Thus, once your energy reserves are exhausted your core temperature begins to fall and you succumb to hypothermia. Even if you are then removed from the cold, your body finds it very difficult to generate the warmth necessary to re-warm spontaneously because your energy reserves are exhausted. Indeed you may continue to cool. These circumstances are sometimes referred to as ‘sub-acute hypothermia’ or ‘exhaustion hypothermia’. 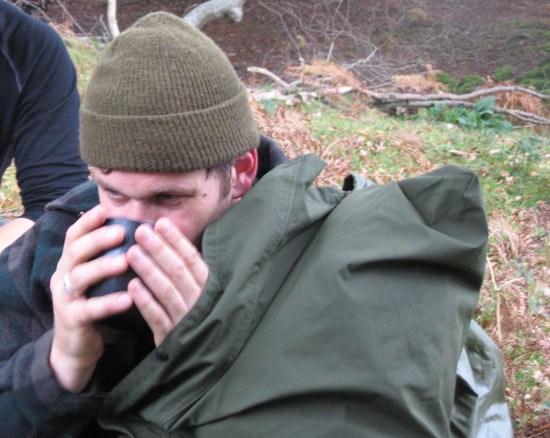 Sub-acute or exhaustion hypothermia most commonly occurs amongst hill-walkers and climbers being exposed to moderate cold combined with windy and wet conditions. This type of weather is common in the British hills. Competitors in endurance activities and events such as mountain marathons are at risk all year-round, not just in winter. There is a seeming paradox that is critical to be aware of. Compare the above scenario to a situation where you are exposed to more severe cold and subject to rapid cooling – such as falling into cold water – while your energy reserves are still intact. Once removed from the cold, your body will utilise its energy reserves to re-warm quickly. Insufficient food decreases the fuel available for heat generation and in the short-term is closely linked to exhaustion (see above). In particular, hypoglyceamia (low blood sugar) has a profound effect on your ability to stave off hypothermia. A blood sugar level below 2.5mmol/l basically shuts off shivering. This level will mean something to you if you are a doctor or are diabetic, used to testing your blood sugar. If you are not so familiar with blood sugar levels – a normal level before a meal would be 4 to 7mmol/l and 90 minutes after a meal a reading of less than 10mmol/l would be ideal. Underfeeding (taking in fewer calories than you are burning) over a period of time reduces your ability to maintain a normal temperature during exposure to cold. This doesn’t necessarily make you hypoglycaemic at any point but over time it reduces both body fat and lean muscle mass. In turn, this reduces your body’s insulation and its ability to generate heat by doing work. Subcutaneous fat (the fat layer under your skin) seems to have an effect on some people’s ability to stay warm in cold environments. There have been cases where otherwise fit but extremely thin individuals have succumbed to hypothermia whereas their companions have not. Dehydration reduces your ability to do physical work. Physical work generates heat. Therefore if you are dehydrated you may find it harder to stay warm. Injury and illness both increase susceptibility to hypothermia and complicate the case of a hypothermic casualty. An injury may make the casualty less mobile and less able to generate warmth. Illnesses can interfere with your body’s temperature regulation. Vomiting and diahorrhea will contribute to heat loss. Sleep deprivation is thought to affect the body’s ability to regulate its temperature because the sleep cycle and other circadian rhythms are linked. Age is also a factor. The young and the old are more prone to exposure hypothermia. Children have a higher ratio of body surface area to body mass than adults. That is, their bodies contain proportionately less heat and proportionately more surface area from which to lose this heat. Therefore they get cold more easily. If you are in charge of young people in the outdoors you must take particular note of this. People over 60 years old have a reduced ability to generate heat as their metabolism slows. Also their ability to limit warm blood flow to their skin (via vasoconstriction) reduces, thus potentially increasing heat loss. Drugs can increase your susceptibility to the cold, either directly through effects on your body or indirectly by affecting your mental state. Alcohol causes vasodilation – the opposite of vasoconstriction – and therefore increases heat loss by bringing warm blood near to the surface of your body. The increase in blood near the surface of your skin is why you go red in the face when you drink. Some prescription drugs inhibit shivering. Alcohol or sedatives will dull mental awareness of the situation and the steps necessary to deal with it such as putting on extra clothes or seeking shelter. Immersion hypothermia is characterised by rapid cooling due to falling into cold water. Conductive heat loss to water is 25 times faster than if you are in contact with air. How cold does water need to be to cause hypothermia? If the water is cooler than your skin temperature, then you will lose heat to the water. This is a large proportion of all water you are likely to come into contact with outdoors! The colder the water, the quicker hypothermia will occur. If you fall into cold water the thing that will most likely kill you, however, is the gasp reflex. If you get past this, then hypothermia is the primary danger. If, after you’ve fallen into cold water, you move your arms and legs vigorously through the water while swimming or treading water you will lose heat even faster than if you stayed still. It’s possible that the extra exertion will generate enough heat to offset the increased heat loss but to predict this is impossible as it depends on too many factors specific to the circumstances. What is certain is that you will use more energy. If someone falls into relatively warm water, only after they have become exhausted will they be unable to generate enough heat to stay warm. After this their body starts to cool and they eventually succumb to hypothermia. A floatation aid increases your chance of survival. Obviously it lessens the chance of drowning by keeping your head above water. The less obvious benefit is that by reducing the effort of staying afloat, the added buoyancy makes exhaustion less likely, so delays the onset of hypothermia. The signs and symptoms of hypothermia are quite variable from one person to the next, even at the same body core temperature. Therefore, you should be as familiar as possible with all the possible signs and symptoms. Dealing with a hypothermic casualty in remote areas is a real challenge; so the sooner you can rectify the situation, the better. Hence, for those of us that spend a significant amount of time outdoors, recognition of the early signs and symptoms are particularly important. You are more likely to spot these signs and symptoms in other people than in yourself. In your group, you must look out for each other. Some people like to divide up the progression of hypothermia into a series of stages and include within these stages easily recognisable signs and symptoms. An early sign of being too cold is shivering. Shivering increases your metabolic heat production to a level between two- and six-times that of your normal, resting rate. This has a short term warming benefit on your body but it reduces energy stores in your body. In the long term, this energy depletion adds to your deterioration by contributing to eventual exhaustion. When your body detects it is starting to cool down below its normal temperature, it fairly quickly starts to shiver so it is a good early indicator of potential hypothermia. Maximal shivering is reported to occur at a body core temperature of 35oC (95.0oF). If you or someone else is shivering, do something about it! Another relatively early sign can be cold, stiff and/or white hands or feet. This is due to vasoconstriction, a reduction in blood supply to the area. This is one of your body’s reactions to cold, intended to keep heat in your core. If your hands are white, cold or stiff it is a warning sign that your whole body is too cold. Again, do something about it! As hypothermia takes greater hold, there will likely be a significant reduction in manual dexterity which, if on your own, could mean you are no longer able to help yourself. Hypothermia progressively reduces mental function, the early signs of which are often missed. The first signs are mood changes, irritability and/or social WITHDRAWAL. This is really important but hard to spot in a group – you have to notice who isn’t noticeable; spot the one who has disappeared amongst the group. Weather conditions can often blunt your ability to observe your companions and you yourself may be battling to cope with the elements and keep warm. Typical conditions under which you have to be vigilant for signs of hypothermia. Photo: Paul Kirtley. Even mild hypothermia can reduce your ability to look after yourself or your companions. Studies have shown even mild core cooling to temperatures in the range 34oC (93oF) to 36oC (97oF) will impair mental function. And as you get colder, things get worse; for each one degree Celsius drop in core temperature from 35oC (95oF) to 25oC (77oF) your brain metabolism drops between 6% and 10%. Decreased mental function translates into poor decision making, indecision, irrational behaviour, confusion and forgetfulness – all dangerous failings in the great outdoors. Heart rate and blood pressure will likely have increased at this stage. It won’t be possible to detect this in others, particularly since exertion and fear promote similar responses. Nor is it likely that you will be able to discern this in yourself since it will be tangled up with other feelings and concerns; people often describe a “sense of anxiety” at this stage. As the victim’s body core temperature continues to drop, their mental function and physical coordination will be further reduced. Weakness, stumbling and repeated falling are typical. They may be disorientated. They may be forgetful or irrational. The may appear drunk. Their behaviour may be bizarre. Shivering may still be present although there have been serious cases where the victim has seemingly progressed to stumbling, repeated falling and stupor without their companions having noticed any shivering. This could be due to lack of observation on the part of the companions or it could be related to the victim’s hypothermia being precipitated by exhaustion. Maybe they didn’t have the energy to shiver? Certainly experiments have shown that once blood sugar drops below a certain level, shivering ceases. As they continue to cool, the hypothermia victim will range from being lethargic to losing consciousness to comatose. Their lips and possibly fingers will be blue (cyanosis). Shivering is likely to have ceased as they will almost certainly be exhausted. Their temperature will plummet as the heat generated from shivering ceases. Muscles become stiff. As their temperature drops their pulse will slow and weaken, blood pressure will drop and their breathing rate will slow. It may be impossible to feel a pulse. The casualty may appear dead and indeed they might be – cardiac arrest often occurs with a body core temperature between 28oC (82.4oF) and 25oC (77oF). It should be noted that fitting signs and symptoms into corresponding classifications of mild and moderate hypothermia are largely based on experiments involving the immersion of subjects into cold water, while the categorisation of the signs of severe and deep hypothermia come from individual case histories, all of which have shown some variation, not least in mortality rate. 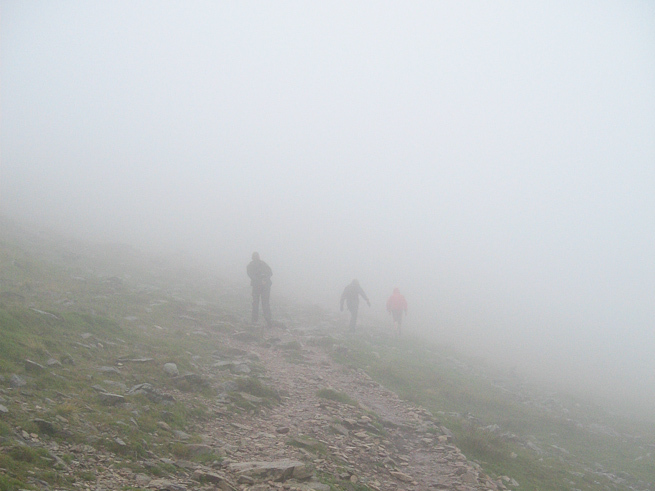 What you might observe in your companions on a wet and windy day in October on the slopes of Snowdon or Mount Washington, could be different to the above. Experiments suggest maximal shivering occurs at a body core temperature of 35oC (95.0oF) but rescuers have reported no shivering in some hypothermia casualties at this temperature. Shivering normally ceases below 31oC (88oF) but has been recorded below 29oC (84oF). Unconsciousness normally comes between 33oC (91oF) and 27oC (80oF) but some patients have been verbally responsive at 26oC (79oF), a temperature at which others have died. 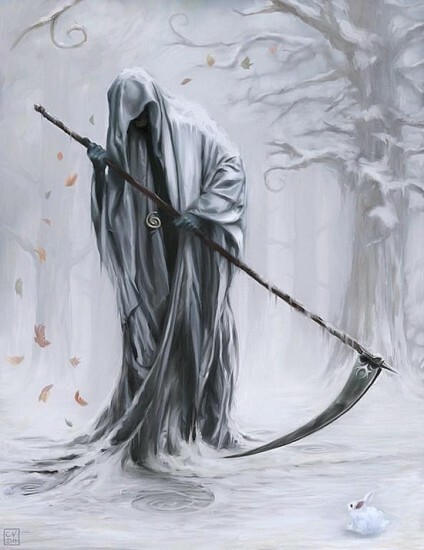 You should also bear in mind that the signs and symptoms are, in reality, a continuum; a sliding scale between ‘feeling a bit chilly’ and death. The ‘stages of hypothermia’ are something we humans have invented to help diagnose and relate how bad the case is. Prevention is far, far better than cure – hypothermia is difficult to remedy in the field. At the end of this article is a strategy for avoiding hypothermia. If anyone in your party shows the slightest sign or symptom of hypothermia, ACT IMMEDIATELY. 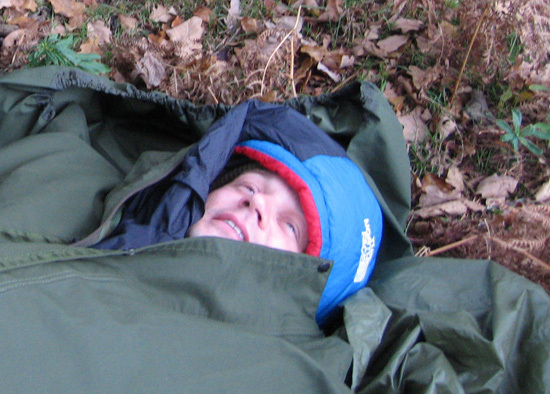 As with the rest of bushcraft, dealing with a hypothermic casualty is about the art of the possible. You do not have an emergency room at your disposal. If you always think to this maxim first, then you will generally be doing the right thing. You must minimise the victim’s heat loss to the environment by addressing the mechanisms by which this is occuring, namely conduction, convection, evaporation, radiation and respiration. For re-warming the casualty, the general principle to remember is the maximum rate at which the casualty should be re-warmed is the rate at which they cooled. If they became cold quickly, you can re-warm them quickly. If they cooled slowly, they should be re-warmed slowly, otherwise the re-warming process may kill the casualty. Re-warming a hypothermic casualty in the field is difficult even for mild cases and becomes virtually impossible with more severe cases. Field treatment of a hypothermic casualty descends into extremely difficult territory once they become unconscious. If the casualty is unconscious then you should prioritise as per the basic life support protocols from your first aid training and the casualty must be evacuated. Remember the maxim of prevent further heat loss. Warm layers, a hat, scarf and gloves should be put on if available. Get them out of cold/wet/windy conditions. If someone is mobile, alert and not exhausted, showing signs of shivering, and/or cold, white hands or feet, then activity to increase heat production should help. You must be careful to avoid them becoming exhausted, so giving them some sugary food and a warm, sweet drink will help to avoid low blood-sugar. A chocolate bar won’t get them too far, however, so a more sustaining snack such as a flapjack or biscuits or similar should be given to them after a little while. Warm, sweet drink being given during a first aid training scenario. Sweet is more important than warm. Also note woolly hat. If they are not exhausted, then getting to a more sheltered spot is probably the best immediate course of action. Stopping in an exposed place will put everyone in the group at risk of hypothermia unless a sufficiently weather-proof shelter can be erected quickly. But the decision to move or stay put can be a difficult call. It very much depends on your experience, your location, your bushcraft and survival skills, and the equipment/resources available to you. The important thing is that you think about the situation and make a decision rather than just blindly ploughing on. If the victim is moody, irritable or withdrawn then it may be more difficult to gain their co-operation. They will quite possibly deny they need help. Sugary snacks and warm drinks may quickly bring them out of this. Bear in mind, however, it is difficult to differentiate between irritability due to hypothermia and irritability due to hypoglycaemia (low blood sugar). Dehydration complicates things further. If they are hypoglycaemic, then activity or exercise will expend the last of their energy reserves and push them over the edge into a more serious state. A judgement of the level of hypothermia based on the level of consciousness can be very misleading. You should always assume that a casualty who is not fully alert to the situation may be moderately to severely hypothermic. If the casualty is anything but fully alert, then you should definitely employ spontaneous re-warming (also known as passive re-warming). This involves laying the casualty horizontally, covering the casualty in an insulating material, providing favourable atmospheric conditions, and minimising heat loss due to conduction, convection, evaporation, radiation and respiration. You then allow the casualty to re-warm through their own metabolic heat production. Most of this warmth should stay with the casualty if you have done a good job of cutting off the mechanisms of heat loss. This has been proven to work well with casualties with mild to moderate, and in some cases even severe, hypothermia that were previously fit and healthy and have sufficient nourishment to produce heat. In the field, spontaneous, or passive, re-warming translates into enclosing the casualty in at least a survival bag or bothy bag. Use any available materials for insulation – spare clothes, dead bracken, etc. Space blankets have been shown theoretically and practically to be no better than a polythene sheet of similar thickness but they are better than nothing. Remember the head is a major source of heat loss. If the casualty is shivering, re-warming will be fairly quick. If possible, the victim should be insulated from the ground with a sleeping mat, rucksack, branches, leaves, spare clothing, anything that reduces conductive heat loss. The casualty should be wrapped in insulating materials. Sleeping bags in this situation are worth their weight in gold. Windproof and waterproof protection should be provided around the insulating layers – a polythene survival bag, polythene sheet, tarp, bivvy bag, tent or snowhole – to provide a protective cocoon. Until the casualty is in a warm, sheltered environment do not remove wet clothes. Instead put insulating layers on top of wet clothing. Removing the casualty’s clothing outside in cold, wet or windy conditions will only make them worse! Remember, we must prevent further heat loss. Once the casualty is in their protective cocoon, do not disturb it until they have re-warmed as you will let warmth out and cold in. Here the victim is likely to be displaying what are commonly called “the umbles”. They may appear drunk. They are quite probably at or near the point of exhaustion. Exercise or activity is not the answer. They will most likely not have the energy and it will make them worse. The maxim, as always, is to prevent further heat loss. Again spontaneous/passive re-warming should be employed. A point to note is that the blood in the hands and feet is likely to be cold and the blood supply to them constricted. Therefore it is best not to warm the hands and feet but to keep them cool. This prevents cold blood being shunted back the core, which can drop core body temperature further. It also prevents warm blood coming to the surface of the skin, drawing heat from the core. Also, cold hands and feet act as a stimulus for the body to produce more heat. If the casualty is conscious and able to take warm sweet drinks, then they should be provided. Not hot, just warm. If the casualty is losing consciousness then food and drinks pose a risk of compromising the casualty’s airway, so should not be given. Do not apply external warmth such as sitting the casualty close to a fire or a stove. Again, this opens blood vessels on the surface, drawing blood from the core. Active external warming from a fire can be lethal. Even if you get the casualty into a warm environment such as a cabin, keep them wrapped up. Otherwise warm air on the skin can cause the casualty to vasodilate. Again this can cause cold blood to be shunted to the core as well as a catastrophic drop in blood pressure. The mortality rate for hypothermic casualities, particularly severely hypothermic casualties, introduced to warm environments is high. The colder the casualty, the more gently they must be handled. The heart becomes much more sensitive to physical shocks and it is possible to easily send a severely hypothermic casualty into cardiac arrest. Beyond mild to moderate hypothermia, there is no reliable way of rewarming a casualty in the field. Evacuation and emergency medical care is now the only option. 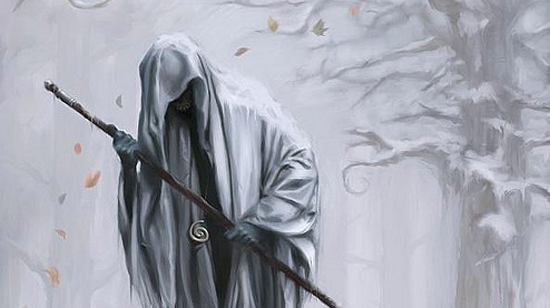 Even if the casualty appears dead, remember they are not dead until they are warm and dead. If the casualty is unconscious, ABC as per your basic life support training becomes the priority. When the casualty is brought out of the water, they will either be conscious or unconscious. If they are unconscious, treat the casualty as per your first aid training basic life support. b) if exposure was prolonged, treat as per exposure hypothermia casualty. If you don’t know if exposure was quick or prolonged, assume it was prolonged. Reduce heat loss via radiation, convection, conduction, evaporation and respiration. Stay dry. Avoid getting your clothing wet-through. Invest in good quality clothing, particularly waterproof rain gear. Use your clothing properly – a large proportion of the performance of your clothing, however good it is, will come from you using it properly. Adjusting layers, venting, donning waterproofs, using a hood, using hats, scarves and headovers all make a big difference. The appropriate employment of all these comes with experience. Take appropriate shelter with you. Day hikers often forget this. Even a polythene survival bag can make the difference between life and death. Eat plenty and often, or reduce your work rate. Hiking trips sometimes mean long, hard days and the energy requirement is high. Cold temperatures increase your energy requirements. Don’t take excessive kit. You do not want to become exhausted because you are carrying a house on your back. Be fit for the activity you are undertaking. You will be less likely to become exhausted. Work within the capabilities of the group. Go at a pace that suits the slowest in your group. Any faster will over-exert them, introducing excessive perspiration into their clothing, and making them more prone to exhaustion. If you are the leader, choose a route that is appropriate for the fitness level of the group. Good leadership and decision making. Good route planning and execution, factoring in potential escape routes and being decisive yet flexible regarding route and weather conditions all contribute to the safety of the group. Look out for each other. Check on your buddies. The early signs of hypothermia are often easier to notice in others than in yourself. Spot signs and symptoms early. Do something about it! Always be vigilant - hypothermia is insidious, stealthy and potentially deadly. Hanson, P. J. V., Loughridge, L. W., Mulhall, B. P., Packenham, D. K., 1984. Hypothermia in hypoglycaemia. Brit. Med. J. 1984, vol 288, 1212-3. Young, A. J., Castellani, J. W., O’Brien, C., Shippee, R. L., Tikuisis, P., Meyer, L. G., Blanchard, L. A., Kain, J. E., Cadarette, B. S., Sawaka, M. N., 1998. Exertional fatigue, sleep loss, and negative energy balance increase susceptibility to hypothermia. J Appl Physiol 85:1210-1217. Hypothermia really can set in anywhere, and can be a combination of events. I was struck years ago after several exhausting days: Despite getting a good dinner and some sleep (at a campsite), I wasn’t warm enough. The muscles in my core don’t really shiver but contract tightly: this brought about vomiting which lasted several hours; during which time I could not even take a sip of liquid. Dehydration made matters worse and I eventually stopped shivering and my brain was shutting down. Luckily, my mate came looking for me and bundled me in insulation. I passively rewarmed for about 2 hours, speeding up as I was able to start taking on liquid. Eventually, some hot soup and bread gave me the energy to get to a train station, and I spent the next 24hrs in bed. I may have been harbouring a bug, but really my old synthetic bag was inadequate and my body was exhausted, and likely dehydrated. It was a real wake-up call to pay more attention, learn more about hypothermia and look after our gear! Articles like this can only help. Thanks for sharing your story. I’m glad to hear you came out of it OK and that you had such a good mate. It really does emphasize that you have to look out for your companions when you are out. Anyone else have any similar stories – where you’ve become too cold or had to help a friend (or a stranger) to get warm? I’m sure these experiences will help all of us learn more. Thanks for that well-researched and very readable piece Paul. I learned a lot. Incidentally, and tying in with the bit about body weight, I know of an expression related to cold weather survival that goes something like this: the fat get thinner and the skinny get dead, ie a bit of body fat can contribute to your chance of survival. Superb information. Having just returned from 4 days of Canoeing and general Bushcrafting this article was well timed. We had no issues. We dressed well , drank plenty , rested , re-warmed and eat the right things (perhaps too much of the right stuff !). The science behind what we do outdoors is so important . It makes everything we do seem even more relevant.Paul is great at presenting both the the Theory and the Practical sides of Bushcraft. Most interested in Hypothermia and recovery / treatments in relation to timescales.Loads of information. Excellent stuff. Ihad an experience in the jungle where a chap had heat stroke (V Bad) but was lucky to have a heli medi vac on call, however, the strecher was attached to the skids outside and the downdraught from the rotors caused him to go totally the opposite way from too hot to too cold. Hi Wyn, thanks for relating this experience for us. That’s quite a turnaround! This article is great! Very informative and it goes a step further than other articles I have seen – it is referenced! It has been a great help in furthering my knowledge base for my ML (Summer) award. not long now until the assesment (I hope). I was out recently with a group of 14 year olds as the assistant leader. One of them unfortunatly succumb to the events of mild hypothermia. The contents of this article gave me the confidence to step in and take control of the situation. All turned out well. We were able to get the youngster off the hill and into a sleeping bag. The whole group learned about hypothermia, the risks and its effects. Thanks for sharing your experience with us. Young people in particular can be very susceptible to hypothermia so well done to you for dealing with the situation effectively. I experienced a few Cold Cases whilst serving in the Army, in Germany and Poland in the Winter its pretty horrific. Also whilst Adventure Trg in Scotland in Jan 98, we had a guy go down, we ended up being Mountain Rescue that day. Great article one of the big dangers I think when outdoors in the UK people seem to think that because it’s not that cold a reading on the thermometer it’s not a real danger. But wet and windy conditions are ideal scenarios to get it and not unknown in the UK even in summer sadly! Excellent article – it can’t be stressed too much that hypothermia is not just a winter/mountain/arctic/water thing. The one time I got caught out was in Cardiff city centre in mid April after a gig! You’re very welcome. Thanks for your feedback. I don’t know whether it was actually hypothermia, but there have been a couple of times I’ve let myself get too cold. Last winter I was an unemployed student and couldn’t afford to heat my apartment (and I was living in Pennsylvania, where it gets pretty cold). I would wrap up in 5-6 layers, including long underwear in order to keep warm, but I would still have to periodically heat my hands under the faucet and heat my feet in the shower to warm them up. One time when I was preparing for an exam, I had for some reason taken off some layers (possibly thinking that I would be leaving the apt soon? ), and was sitting around studying. I got up to wash some dishes, and when I put my hands under the hot water, I all of a sudden started shivering pretty strongly. I hadn’t even realized how cold I was. I took my temperature, and it was 96 degrees F, so not quite hypothermia, but I realized how careless I had been, and immediately drank a hot beverage and wrapped up again. The other incident is almost too embarrassing to relate. I had been kayaking on a lake in April, and the water was in the forties. I went to my car to get the cover for my kayak, and left my kayak flipped over on the shore so that the water could drain out. When I got back, my kayak was nowhere to be seen on the beach. I looked out in the water, and there it was, getting rapidly pulled out by the strong wind and current. 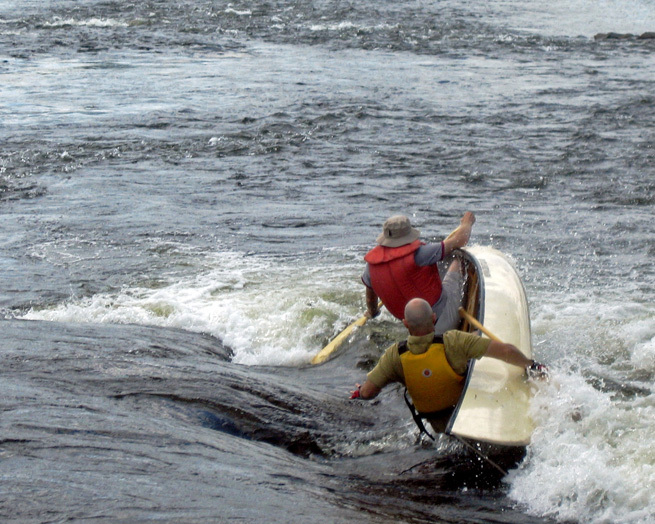 The kayak had been flipped over by the wind, and pushed out onto the water. So what did I do? Like an idiot, I kicked off my sandals, dropped my car keys on the ground, and ran into the water after the kayak (fully dressed). I was only able to swim after it for a little bit though, as I soon became exhausted. I took stock of how much of my body I could still feel, and decided that if I didn’t turn back, I might very likely drown. So I gave up and turned around (and fortunately made it back). Luckily some fishermen headed out soon afterward in a motorized boat, and they offered to take me across the lake, to where my kayak had fetched up on the opposite bank. But I’ll never forget how cold I was. I sat in the sun for a while, all slumped over because I was too exhausted to sit up, and I remember that my skin hurt as it warmed up. It took sitting in the sun plus a 40 minute car ride with the heat blasting on me at the highest setting before I stopped feeling cold. I also developed a very congested cough that lasted for the rest of the day, although I don’t think I inhaled any water. Anyway, that is probably the stupidest thing I’ve ever done in my whole life, and I’m just glad I survived it with no injury. Hopefully I will never make such a dumb mistake again (and I will definitely never tell my parents about that little incident). I do unfortunately tend to be a little cavalier about the cold, especially after last winter when I was cold all the time which really increased my tolerance for it, so it is good to read articles like this to remind myself of how dangerous cold can be. Thanks for sharing your stories. Not many would be so open and honest about their experiences, particularly when they realise they have made a mistake (such as with your kayak story) but you have obviously learned from the experience and in relating the story, it will also potentially help others make better judgements in the outdoors. The risk of hypothermia is something I’ve always been very aware of, many years ago when I was a cadet we studied the causes of, the treatment of and prevention of hypothermia in some depth. I was lucky that we had some very experienced ex forces instructors in my unit. Too many times when I’m out hiking or camping I’ve seen people not dressed properly for the conditions, my own girlfriend is very guilty of this she sometimes thinks that I’m being over protective but its better than not caring I guess. Great work on this as it’s definitely something I think the majority don’t take seriously. Nice tips Paul. I was surprised to see that hypothermia can really set anywhere in the globe, even here in the tropics. Wonderful blog BTW. Learning a lot from previous posts. Excellent information. Enjoying your blog, thank you for your time and sharing your knowledge. Thanks for taking time to comment and for the feedback. Much obliged. This is my first article that I have read on your website and I just had to thank you for the wonderful information(very concise) on behalf of whomever it might be that benefits from it when I am out in the field. Hi Rory, thanks for your comment. It’s good to have you on board. Please do spread this information far and wide so it is useful to as many people as possible. Thanks for sharing your experiences with me and other readers. Getting this collective experience written down, along with the article above it is also very valuable. Thanks for such a useful and thought provoking article. It has certainly made me very aware of how scant my knowledge is. Excellent and accessible-for-all articles. Great info as always. THIS IS ESSENTIAL READING. I find that a lot people, Seem to know about high end clothing, or how to deal with hypothermia. Yet the basics of food, water, recognising the first signs and how to react appropriately, seems to of passed them by. Thanks for your comment Kharled. Yes, people worry about all sorts of ‘dangers’ in the outdoors. Vehicle accidents, hypothermia and drowning are what people should really be concerned about. Great article and despite knowing a lot of this stuff, it’s still essential reading. Why? because the more I read it and understand it the better I’ll be able to recall it when I need it under pressure. Hi David, thanks for your feedback. I agree, this knowledge should be etched on the inside of your skull. I also work to keep it fresh in my mind. You are right that useable knowledge is the key. The best article on hypothermia I have read. Thank you Paul.!! Your assumptions are all good ones to make – best to err on the side of caution. Let’s hope you never do experience it either. Your precautions of regular stops and warm food/drinks in cold conditions are good ones. Thank you for the great article, it was very thorough and precise and to the point. I look forward to reading your work. Thanks for your comment and feedback on the hypothermia article. It’s much appreciated. Excellent article Paul. I had not realized that we are still loosing body heat @ 82f 28c . I have always been very careful a about dehydration on walking safaries in the tropics but never considered the possibility of hypothermia being a risk, other than keeping warm at night when the temperature drops quite considerably under clear skies. I shall have to rethink my risk assessment. Many many thanks for all the info and the time you must have spent writing this article. Hi Paul, I am in my sixties now but about forty years ago I had hypothermia. I was out with friends for a night sea fishing, the temperature was low enough to freeze sea water on our rods. I was inadequately dressed and started severe shivering, luckily one of our party was an ex paratrooper and recognised the symptoms, however, I was told, I became quite aggressive to anyone who offered help so my companion waited until I had stopped shivering and was digging a scape in the shingle so I could curl up and go to sleep, then he and one other took me back to his vehicle and got me warmed up and fed with hot sweet tea and some hot food. I was very lucky to be with the ex para as he was the only one in the party that knew the symptoms, but for him I may well not be here now. I have since made it a matter of importance to keep a check on anyone I am with, whilst out, for any sign of hypothermia. I hope this has been of some help to someone. Thanks for sharing your experience with others. Great article. It was good to see your notes on not eating correctly and looking after yourself before even venturing out. As a TA officer years ago, before going on exercise, I would stop at a chip shop so the lads could carb up. Most had come straight from work and often did not have time to eat. Usually followed a long weekend without sleep in the horizontal rains of Sennybridge. Well the lads who did not carb up or were unable to brew up at a drop a hat, usually went down with hypothermia , annoying for me as they had been issued with the kit but they would dump it. But the lesson is fuelling yourself up is as important as the kit we wear. The other lesson is fitness, the example I had was a venture scout who had just recovered from a dose of flue came out on a winter two week trek . Three days in he went down with a mild hypothermia. He had not made us aware he had been ill. However two days in a support vehicle and feeding up and he was able to continue. Thanks for good article and being generous with your knowledge as always. I’ll pass it on. One of my experiences with hypothermia was when I was young. Hiking up in Nelson BC with my Dad and his friend. It was early March and still very much winter at high elevations. I had only sneakers for foot wear. And after having to pass through several snow slides on the trail my feet got soaked, and cold, then it all started. The fact I kept hiking kept me warm. But once we got to the old mine site we stopped and I cooled down fast, shivering started and my Dad became concerned. So we left but I was having a really hard time walking and standing. But I got back to the Van, and stripped off my wet shoes, socks, and pants. Dried off and sat in the front seat with the heater blasting all the way home. I guess my core temp dropped a bit, as I couldn’t get warm. So I got put into a hot bath and layied in it for a good time. My Mom wrapped me in Wool blankets, and I started to warm,… Then slept for about 8 hrs, lol. The point of this story is ALWAY S HAVE GOOD FOOT WEAR AND A CHANGE OF SOCKS. And since that day I have always stuck to this rule. Cheers. I have never had a serious experience with hypothermia, but my dad always tells my brothers and me to always be careful. He would share a story when he was camping and doing a lot of swimming in the morning, he was hit by hypothermia in pretty warm weather. He spent the rest of the day in his sleeping bag while people were walking around in tank tops and shorts. This is a great article Paul and I will make sure to watch for signs of hypothermia, especially when the weather is getting colder. Thanks so much for this wonderful well thought out article and for sending me an email to point it out! I especially liked the part of not taking off the person´s clothes when they are wet. I have always built a fire, gotten the person into dry, warm clothes and then cocooned them with someone else in a sleeping bag. Good to know the dangers of doing that. As always it’s good to hear from you. Thanks for your comments of appreciation for this article. I hope it proves useful to you, at least in avoiding or protecting against the situations which can lead to hypothermia. With respect to cotton, it has its place. Place is the key word. Next to your skin is a no-no. It does not inherently keep you warm and holds a lot of moisture and you will end up cold wearing cotton next to your skin in cold conditions. Instead, wool (preferably merino wool) or synthetic base layers are a must. Silk is also comfy but I prefer merino these days. Cotton as a windproof outer shell layer in cold, dry conditions, however, is very effective. It’s breathable (so you won’t get as hot and sweaty in your layers underneath) as well as protecting you against wind chill. Moreover, fabrics with membranes such as Gore Tex, eVent and Triple Point don’t work well in extreme cold. This is because sweat fails to remain as vapour before passing through the membrane and so condenses or even freezes on the inside of the garment. In such conditions, tightly woven cotton is better. You can go for a plain cotton twill or gaberdine. To my mind Ventile is a superior option if cotton is the fabric to have as it also offers some protection from environmental moisture. reality that all seamen and outdoors enthusiasts cannot safely ignore! Brilliant article Paul – after quite a number of years trotting around the Angus Munros, I can heartily recommend the Buffalo Special 6 shirt. Yes you will sweat like a pig climbing a Munro fully loaded, but the venting options help to alleviate that, but as you’ll probably know, they come into their own when you’ve stopped. A really wonderful garment, and paired with the hood and mitts a real lifesaver. Here’s a true story – when young and foolish, I was effectively abandoned by my friends (they didn’t turn up) at a disco in the middle of nowhere with people I didn’t get on with, so I decided to walk home (a small cottage, literally in the middle of nowhere). It was December and thankfully snow-free (though there were remnants in fields) but bitterly cold and my walk was basically 11 or 12 miles along country roads in Dumfriesshire. I was dressed in jeans, thin socks, Dunlop Green Flash, a t-shirt and a leather bikers jacket – no gloves, no hat, no scarf – total madness! I started walking and thought I could hitch, but the further I got and the deeper the countryside became, the less cars passed me, until it was just me, the moon, deer and empty frozen roads and fields. I was exceptionally cold, but knew that if I stopped, I was done for, so running and walking were the order of the day. I got home and had to kick the door to wake my Mum (I couldn’t use my hands or arms) – she got me in, hot drinks, blanket around me and then to bed with the electric blanket on all night . . and I survived. Looking back, whether the cold was affecting my mental processes I don’t know, but it was one of the greatest and most beautiful walks I have ever experienced. The silence was immense, as was the knowledge that nature does not take kindly to stupidity. Thanks for sharing your story. It’s interesting how some of the most challenging things we do outdoors – whether intentional or not – also reveal incredible beauty and yield the most vivid memories. Good advice, Paul, even in the hot, humid jungle, hypothermia is a danger. Every year we see ‘news’ reporting of the misadventures of nice folks out for a day hike of one or two hours stumbling into trouble without any prior preparation. Usually wearing all cotton clothing and flip-flops or sandals (with no equipment other than the ubiquitous plastic bottle of water! ), they hike on a beautiful summer day and are unprepared for the vagaries of Mother Nature who (no anthropomorphic supernaturalism here) cares not a whit for them. Indeed, being a force of Nature and not a sentient being, she is not even aware of them. Thinking and planning ahead is our job as adults. If you cannot bring yourself to do that, consider staying home, at the very least, leave the wee ones at home until such a time as you acquire a better understanding of what you are dealing with by reading, dare I say it, Paul Kirtley’s Blog. Thank you Ron. Well let’s hope people learn from somewhere. “Thinking and planning ahead is our job as adults” – I couldn’t agree more. Your other comments reminded me of the title of one of F. Spencer Chapman’s books. ‘The Jungle Is Neutral’, which assuming you haven’t read it already, I’d thoroughly recommend. Would have put Mr. CHAPMAN’s book to good use if it had been available in 1967. While a young man, stories from veterans and official reports about the WW II South-East Asia campaigns (aka the CBI); here in the States became available, if memory serves, they were usually about the unceasing hardships of the 5307th Composite Unit (provisional) fighting both the terrain and weather as well as the enemy deep in the jungles of Burma. A little later came details of SAS/SBS exploits (and lessons learned) in Malaysia. Then came books by Bernard B. Fall (KIA Feb. 1967), specifically: ‘Hell in a Very Small Place’: ‘The Siege of Dien Bien Phu and Street Without Joy’. The point to the above: Forewarned is Forearmed (PPPPPP!). Great article…….hopefully, I’m never in this situation but I now know more than I did before!!!!! I just read about drinking water so you can keep warm too as your body needs water to generate heat. Didn’t know that one! Hi Gavin, yes good hydration is important for proper body function. My Dad was a search and rescue pilot who worked with the mountain rescue groups all over the country – he was very big on making sure us kids knew how to keep safe in the wilds and at sea, and obviously saw hypothermia in all it’s stages an awful lot. One September, he drove home on his motorbike from his base to our house, which at that point was a four hour journey. It rained the whole journey, and the moment he got off the motorbike, I knew he wasn’t right. He couldn’t talk properly, he was slurring, he couldn’t get his leathers off (they were soaked through). I stuck him in bed and made him hot chocolate, and had to keep and eye on him all night as he slowly warmed up, with the doctor on the phone occasionally to make sure we didn’t need an ambulance. If he wanted to impress upon his 16 year old daughter the importance of keeping dry, even in a mild September, he certainly succeeded! It really proved to me that you don’t need to be out in the wilds to get hypothermic – he was just on a windy bike ride, immobile, in the rain, for too long. It was a very mild day, but that didn’t make it any less dangerous. Hi Paul, great in depth article. I’m new to bushcraft. I want to get some clothing items such as waterproofs and base layers but can’t afford to spend a fortune on them. Any recommendations on good entry level clothing to buy. Thank you Paul, this is a really good article. It highlights how hypothermia can strike almost any time and anywhere. I work out of doors, and always carry a cheap silver plastic sheath in my daybag, regardless of the weather. These be found in “pound shops” during the camping season and they weigh hardly anything. Whenever my local shop has some in stock, I buy a few. They are effectively “one time use” and I am not recommending them as an answer for more serious conditions. However, they have given me somewhere dry to climb into when I have been caught in a squall “out in the field”. I once used one to give me, my partner and our dog some instant shelter when we have been caught out in unexpectedly cold and very wet weather on a summer hike. Thanks for your comments. I agree that something is better than nothing. Moreover a marginal improvement in these situations can make all the difference. Plus you are thinking about the possibilities even when just out for the day, which puts you a step or two ahead of many people. Great article, very important to understand the effects and how to avoid hypothermia while out. Had hypothermia when I was very young, and never had since, lessons learned at an early age, that have stayed with me. Poor clothing, very harsh snow conditions and a long way to travel to shelter, no hot drink or anything to eat, a combination of factors which brought on the symptoms of hypothermia rapidly. Luckily I made it to safety, but that was the start of a painful process of gradual re-heating, as rapid heat to a hypothermic candidate is unbearable, and dangerous. Not something I wish to repeat anytime in the future. Thanks for sharing Paul, there are plenty of pointers in this article to refresh and remind you that preparation for conditions you are adventuring into, are key, and knowellege of what to do, so you can react to the symptoms early when spotted. Certainly reminded me not to be complacent. Many thanks for a really interesting article, I was in the strip off and get personal camp until now. I’ve been too cold twice, once when I did my safety and rescue training for my level 1 coach award, I was totally unaware of there being anything wrong until a colleague told me, apparently several times that I was shivering. It was a violent uncontrollable shiver, my only thought from that point was to get off the water, out of the wind and get myself dry and warm. Cold, wet and exhausted are definitely not a good combination. The other time I got too cold it was only my hands, I put them under cold water to warm them up and scalded them, I won’t do that again. As it’s summer we had better not forget hyperthermia, one for another day. I’ve been teaching a session on hypothermia about twice a year for a while now, and as far as I could tell your managed to present it comprehensively and accurately. I would possibly add that if you have a severely hypothermic patient then checking the carotid pulsa may trigger ventricular fibrillation: check the femoral pulse instead (the radial pulse is not dependable!). Oh, and a defibrillator — should one happen to have one in the wilderness — will not work on a hypothermic patient. And if you are uncertain and start CPR unnessesarily you may en up with ventricular fibrillations. In winter one may consider carrying a thermometer with a probe on the end of a cord (e.g. one of the indoor/outdoor ones) and inserting the probe rectally: then you can monitor something resembling core temperature while the patient is fully dressed. Good and timely advice. There is a saying here in Switzerland: there’s no such thing as bad weather, just the wrong clothing. I remember a Scout leader of mine saying that whenever he hiked Snowden, he kept a roll of large bin bags on him to give as emergency raincoats to the tourists who were wandering around the mountain top, having arrived on the train. Looking back, there have been a couple of times when I have been mildly hypothermic, once on the mountains and once after a cold wet motorbike ride. Fortunately when I go out for a wlk, I tend to carry the kitchen sink with me so (so far) I haven’t been caught out. Very interesting informations, very helpful. Thanks again and again, Paul! Thanks for a most informative and easily read article. Several years ago while acting as an adviser for a small group of teen aged venturers on an overnighter in the mountains of British Columbia one of our group failed to return from a hike. We immediately started a search and after about 2 hours located the missing girl. The weather was moderate but very humid and the situation most stressful. I had been perspiring heavily and on the way back to our campsite i became extremely fatigued, to the point where anytime I stopped moving I fell asleep. I could only walk about 100 feet at a time. In my addlestate I thought all I needed was some rest and urged the rest of the group to carry on and I would follow. Fortunately my son recognized the situation was more serious than it appeared and challenged me , saying things like “what’s the matter old man, can’t keep up?” It was enough motivation to keep me moving and we made it back to camp where a fire and some hot food restored me to normal. The point here is that the weather was not severe and at no point was I ever cold , however I was extremely stressed and perspiring heavily but I later realized I had been in deep stages of hypothermia. All turned out ok and it was a lesson that hypothermia can strike when least expected. All the years outdoors I was hysteric when it started to rain a bit. Not next to home of course, but when we were hiking in groops with the first raindrops i gave strikt order to throw the ponchos over. So I never had a serious problem. In the end of last summer I was sitting on the funny camping ground in Hamburg – Blankenese. Families around and children playing in the river of Elbe. Suddenly I saw a large dark grey clowd coming from south. I went in my 40 € miltec cross dome igloo tent, put my always packed rucksack on top of two gingerale bottels and got a phone call, when the first drops started to fall. So I closed the tent and used the phone untill I stopped that because it was raining so strong through the textile of the new tent, that I thought it would be better to protect the phone. When it stopped raining I looked out and was sitting in a small hill of hale ice like a fish at the supermarket. My primark jeans was wet, as if I would have taken a bath in it. So, by the way I really can recommend that miltec tent. It gives you the chance of the feeling of adventure and danger in a strong summer hale at the beach of Hamburg, phantastic! But also older tatonka tents and other stuff like that you could find in the dustbins, after the families had all left two hours later the camping ground . Through my old german military poncho never came a drop in 20 years may be a nato stock number isnt such a bad thing. The next day was a bit rainy, so I could not dry my jeans. When the sun left, the temperature fell to perhaps 12*C. The jeans was half wet, half dry, so i put of my spare jeans and the wet I put on, went to the bar, ordered a beer and took seat on the terrasse. While I was speaking there with somebody interesting the temperature fell to 10*C. After tree houers I had to change the jeans, which was still wet, because the cold cotton really produced a remarkabel pain on my skin. In a serious situation it would had been better to walk in the underwear in the valley! So far my outdoor experience with equiptment thousends of people use for weekend and dayhikes! Good night ladies! That is incredible dangerous! If you do not light a fire in such conditions, if you dont have sparetrousers, if you dont keep walking, because it becomes perhaps dark in the mountains, and you dont have a torch, if you sit in such a cheap rubbish tent with wet clothing and the next heavy rain comes down and you dont know to start a fire… I think you will die! In your tent and wet jeans or by falling over a rock if you try to get in the valley and your torch became wet. — a victorinox and a cigarette lighter would have saved you, if you would had been informed. That’s the point! I really recommend to everybody to try that in front of his house out next april: 3 hours sitting in a wet jeans on your terrasse at 10 degrees Celsius! — it is amazing! My cheap 30 € decathlon light zipp off trosers with only 35% plastic in the webbing are drying on the body in 20 minutes used german army trosers the same. Its not a question of money that makes the difference, but a question of information before you buy equiptment and at first: How to start a fire! Thank you so much for sharing the wealth of your knowledge and experience, it’s makes for great reading and forms the foundations for other people’s self confidence to go out there and experience wild camping which they may not have otherwise done. I am humbled by the fact that you give all this knowledge freely without any thing in return – well done and thank you. My pleasure Raymond. I’m glad you find this site so useful. I hope you keep on squeezing as much know-how as possible out of it for many years to come. You know where I am if you have questions. great article on hypothermia.good to see you wrote about the effect of drugs and the cold.Since ive been on morphine ive noticed that I feel the cold more than I ever did before.I usually don’t reach for the thermal base layer unless the weather is extreme but now find I feel the wind chill much more. Thanks for the great article again. This is very usefull to us. As canoe people we insert one evening yearly addressed to Hypothermia just because it’s one of the most underestimated dangers to outdoor people, specialy canoeists. Myself, I’m aware of this danger Downstream Danube from April to October. Even if the temperatures are not that low you always need to protect yourself agains Hypothermia. Good article. I’m really glad to read that you downrate the supposed “space blankets”. They often get quoted as highly efficient insulators, but are only effective against radiant heat, very little of which is generated by the body, especially in hypothermic conditions. Their best use, as far as I’m concerned, is as a layer between tent groundsheet and the ground to keep the mud off! Thank you Paul. Really informative article. Will share this with my walking group if you don’t mind. over three days and the weather was very challenging! hi paul you certainly got some of my brain cells working on this forgot more than i know this is something i do automatically and forget to tell people why i do it always stop and make a cup of tea hot food more often layers of clothing hats pack with emergency kit bivy ect knowing limitation of group in my case 4 adults all retired enjoying the quietness except for the wild life sounds and trying to identifye. colours of the scenery using camp sites rather than wilderness but still leaving plan of route with camp warden should something go wrong we survived some cold winters 1963/ 86/learnt from those to keep warm we look more like scott of the antarctic in the hills of derby but use hotel if to cold we have good quality tents clothing sleeping bags we know what the outdoors can do to us try to cover every eventuality in our planning even for weekend . hi paul you certainly got some of my brain cells working on this forgot more than i know this is something i do automatically and forget to tell people why i do it always stop and make a cup of tea hot food more often layers of clothing hats pack with emergency kit bivy ect knowing limitation of group in my case 4 adults all retired enjoying the quietness except for the wild life sounds and trying to identify. colours of the scenery using camp sites rather than wilderness but still leaving plan of route with camp warden should something go wrong we survived some cold winters 1963/ 86/learnt from those to keep warm we look more like scott of the antarctic in the hills of derby but use hotel if to cold we have good quality tents clothing sleeping bags we know what the outdoors can do to us try to cover every eventuality in our planning even for weekend . Great article Paul, thanks for sharing this and all of your knowledge with the world. If only this and first aid was taught in schools more often people would be much safer and more confident outside. Indeed Theo, first aid training at school would be a good move forward for society as a whole. Once again, many thanks for your advice and guidance. I am sure that in this case lives will be saved by knowing the information that you have shared. The importance of fending off cold injuries has been drilled into me for many years and I never go on a hike without additional warm kit even in summer…..probably because I am British. I was caught out during the floods back in 2006 and started to show early signs of hypothermia. Luckily because people like yourself shared their knowledge with me previously, I recognised the danger and managed to get control of the situation. As Brits, I sometimes think that we are at significant risk of heat injuries and it surprised me how quickly heat injuries can debilitate someone when I have seen them. I have even seen people show mild signs of heat injury in winter simply because they are not venting properly when exerting themselves. Anyway, I thought I would leave a little feedback. As always, thank you very much for your advice. Thanks for your comments. I appreciate you taking the time to leave some feedback as well as share some of your own experience. Thank you very much. As always I searched the net about hypothermia and found nothing of use. I do not know why i even bother to search in other places than your blog. It is a really great ressource. I hope I will never be in the position, where I have to rely on the Informationin this articel, but it is good to be prepared. Again. Thank you for sharing. It’s always a pleasure to share useful, clear information. I’m glad you found this so valuable. Hi Paul,really informative as always.I think the way you dress and use your clothing outdoors is a very important factor.Staying dry at all costs.Have kept this post to read a few times over.